Most of the buildings are gone, but the one in use by the Spice company remains. Crown Height's Consumers Park Brewery on Franklin Ave. In 1908, when Charley Ebbets was looking around Brooklyn for a place to build his ballpark, he decided on an obscure part of town near Prospect Park that lay in between the neighborhoods of Flatbush and the St. Marks District. It was called Crow Hill, and was undeveloped, an ash dump, actually, with little going on except for a couple of rambling industrial complexes. One of these industrial groups was the Flatbush Hygeia Ice Company, at 984 Franklin Avenue, and the other was home to the Consumers Park Brewery; a complex of buildings that made the beverage that helped make Brooklyn: lager beer. For Charles Ebbets this was perfect, for what goes better than baseball and ice cold beer. I can still smell the spices when I walk by. I fixed the name of the complex. I do find it wierd how much unused land there is around the Spice building. Assuming it is zoned residential, I suspect we will get some more neighbors. There also used to be a BRT Consumer Park stop on what is now the Franklin Ave. Shuttle; that stop was later replaced by the Botanic Garden stop. The 1918 Malbone Street disaster was between the Consumer Park and Prospect Park stops. I see from the old map posted above that there was a street that ran through what is now part of the Brooklyn Botanic Garden. I wonder what used to be there. Is it just me, or do others hear a "tick, tick, tick" noise as one walks by this complex and the surrounding vacant lots? A "tick. tick, tick" that ends in the spices being moved to ENY and the site being converted into condos, and a lot of construction on the surrounding vacant lots. So that old cement building just past the spice building used to be a train platform? I always wondered. is it just me, or do others hear a "tick, tick, tick" noise as one walks by this complex and the surrounding vacant lots?A "tick. tick, tick" that ends in the spices being moved to ENY and the site being converted into condos, and a lot of construction on the surrounding vacant lots. I heard this evening that this site has been sold. No word yet on who purchased this lot; I don't think that info is of public record yet. Maybe another set of 20+ story apartment buildings can be constructed? ETA: The spice factory is zoned R7-A according to this map? That is huge, but not surprising news. One of the sites with paid staff (Curbed, Brownstoner, Real Deal, etc) will likely break the news of who bought it sometime soon. Here's a little about R7A. So, we won't get anything taller than the building in the photos (see above link) unless affordable housing is included. ...only as a result of including affordable units, were the Tivoli and Ebbets Field buildings able to be so tall. BTW, I suspect and hope that some of the large brick buildings survive. They are good looking enough that I suspect people will pay to live in them, and could pretty easily be made into residential. Franklin Avenue won't smell like spices anymore. I assume it is a profitable business, and will relocate elsewhere. I am interested in whether the new owner bought the whole business, or just the buildings and the land. If they just bought the B and L, I assume a lease was written to allow the business time to move. If they bought the whole business, the operation could be closed, the employees left without jobs, and customers with one less spice supplier. Lev stated that at present, the business has not been sold and that there are no plans for it to close and/or relocate. He is willing to meet with me to give me the history of the building, but is not able/willing to meet with us on a weekend to tour the facility. Those who like the smell of spices in the air should be happy to read this. Thanks for this update. I love the ambiance the building brings to the area, plus the smells! Glad the neighborhood will be at least keeping some of it's roots. In other words, prices in this area haven't gone up enough yet to justify a sale. Once the four building complex is built on the site of the old Laundromat a block away I have a feeling that they'll reconsider that position. As much as I enjoy being able to smell those spices in the air when I walk by, I'm skeptical that it will still be used for its present purposes five years from now. I have kept it on my list of Big 16 Developments for those reasons. This site will be among those discussed on a walking tour held on Saturday, May 2, 2015. They may just be stabilizing the building, it is in bad shape. Also, there is a small sliver of land directly adjacent to the shuttle tracks that supposedly is still available to be leased. My present theory is that we are seeing a scope of work document being created. This document will become part of the RFPs that demolition and finance companies review before the adventure begins. Today, I determined that the upper windows were bricked up and it looks like plywood was put on others. They also knocked off small pieces of the building that were already falling off. Boom! The Real Deal has now published that a developer is now in contract to purchase at least part of the Spice Factory lots, enough for 200,000 BSF. I believe my photo is more accurate than the Real Deal's https://therealdeal.com/2017/09/18/lincoln-equities-makes-move-into-brooklyn-with-deal-for-crown-heights-dev-site/ "The two lots at 120-136 Montgomery Street are located to the west of Prospect Park between Crown Heights and Prospect-Lefferts Gardens, and they are currently occupied by a three-story 21,900-square-foot building and a five-story 66,900-square-foot building with frontage on Franklin Street." So, I believe this sale to include the building and vacant lot in the above photo. And, it would not surprise me if the site went for over $80M. I hope they retain some of the architecture on the site. Perhaps the work on the roof of the brewery is a sign they want to protect against further damage during development. the architecture is surely unique and always fascinating. Modern building today are built on the cheap and haven't a care for uniqueness. If they go condo, some of those sturdy brick buildings are likely to be kept. Today's article on the topic seems to indicate how few details are known: https://therealdeal.com/2017/09/19/eichner-partnering-with-lincoln-equities-on-giant-crown-heights-resi-development/ Bruce Eichner’s Continuum Company and Joel Bergstein’s Lincoln Equities are planning to develop a 1-million-square-foot mixed-income residential project in Crown Heights — one of the largest developments in the history of the neighborhood. Lincoln recently went into contract to buy two parcels at 120-136 Montgomery Street spanning a combined 88,800 square feet, as The Real Deal reported Monday. Speaking at the RealInsight New York Multifamily Summit on Wednesday, Eichner said the partners are buying a 120,000 square-foot assemblage and it wasn’t immediately clear which lot makes up the balance. He declined to say how much the partners paid for the site, but claimed the entire project will cost more than $500 million. Cushman & Wakefield’s Robert Knakal is brokering the land sale. The partners hope to develop four buildings and earmark 50 percent of the units for below-market rents in return for a rezoning that allows for more density. The project still has to go through ULURP and win city approval. According to Eichner, it will be built under the city’s Mandatory Inclusionary Housing program. Eichner also said he will develop the project with union labor. He claimed AFL-CIO’s Housing Investment Trust signed a letter of intent to finance the development in a bond deal that would cover 75 percent of the cost. The trust could not immediately be reached for comment. My guess is the empty lot directly south of the buildings. It looks like the same entity owns it "HPG Associates Inc" but documentation only shows a Memorandum for the lots that boarder Montgomery. @dmiami2 Yes, that lot is now confirmed. "The partners are also buying two adjacent lots at 964-968 Franklin Avenue." They updated the article. https://therealdeal.com/2017/09/19/eichner-partnering-with-lincoln-equities-on-giant-crown-heights-resi-development/ 966 Franklin, 964 Franklin, 968 Franklin, 120 Montgomery, 122 Montgomery, 124 Montgomery, 126 Montgomery, 128 Montgomery, 130 Montgomery, 132 Montgomery, 134 Montgomery. Those lots have been vacant for as long as I could remember. The lots are also interestingly shaped. Watch this...is this building landmarked? The Memorandum is for the whole lot (block lot) and the "Property"... So it's the whole enchilada. All the buildings... Those addresses on Montgomery don't define the purchase. The only structure that is not yet confirmed is the one story building between the tall buildings and the odd shaped empty lot to the south. If that site at 103 Empire (the corner of McKeever Place and Empire where the laundromat used to be) and the site of the Rite Aid (Walgreens bought the chain) were to be purchased and developed, then we can call the site surrounded. So, maybe five years from now? The large building might have value as housing, so it might survive in some form. "That means the project will have to go through the formal public review process known as ULURP." Hahahahahahahahaha! Shall I bring the popcorn? It's interesting how there didn't seem to be much interest in having it landmarked. Landmarking someone else's property against their will isn't as easy as some people believe it is. https://www1.nyc.gov/site/lpc/about/the-designation-process.page We live in a city with pretty strong property rights. I would love to have the resources to be able to research whether the union is really coming up with the financing, as opposed to it being a pretty clever move by the union in conjunction with a large investment firm to get more "bang for the buck". ...It certainly could work. What happens if they fail to get the rezoning? If they fail to get the rezoning, they are allowed to build fewer square feet, and buildings that are less high. As a result, they would only build market rate units. However, they could build fewer apartments. ...and they might not be able to recoup their $75M investment. People opposed to the site being rezoned yelled at the CB9 mtg last night. https://www.brownstoner.com/development/spice-factory-rezoning-crown-heights-brooklyn-cb9-alicia-boyd-960-franklin-avenue/ "The current proposal comprises six towers, ranging from 15 to 37 stories high. 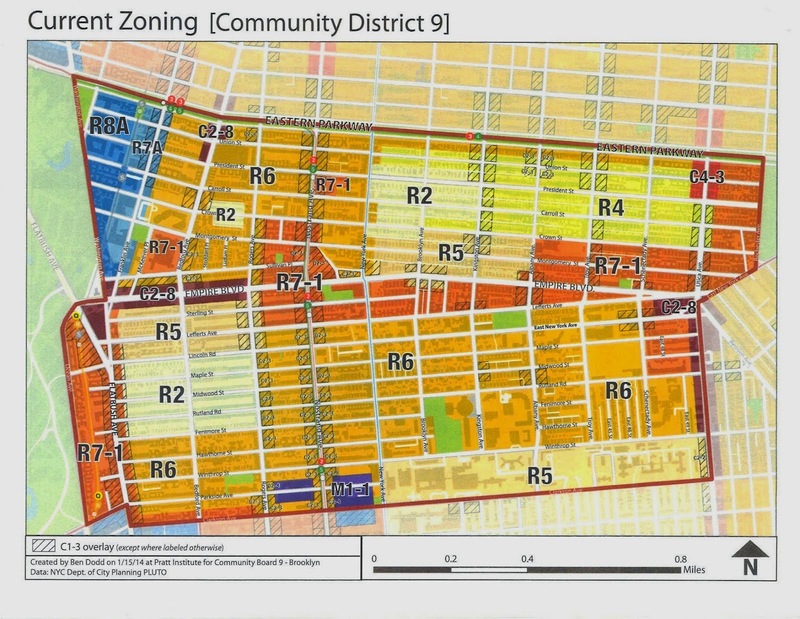 Included will be 1,500 apartments, half of which will be affordable, with 300 of those at 50 percent of the area median income, according to Michael Liburd, chair of Brooklyn Community Board 9’s ULURP committee, which considers land use and zoning variances." I remain amazed at the hypocrisy of some of these folks. These were the same people who are demanding more affordable housing...but when a developer shows up with a plan to actually build affordable units they shout that down too. I understand the need for more affordable housing but it's hard to have sympathy for the people who need it when they hitch their wagons to alicia boyd types. The volume of passengers on the Q and B train may approach L-train levels once all the development is finished. What about that? Yeah, point taken about the height but the refusal to engage in conversation about a compromise position is what gets me. If you want more affordable housing the most realistic way to get is to give developers incentive to build it, whether tax credits or the right to build larger buildings. Not to mention that more supply should also drive rents down. Not to mention that more supply should also drive rents down. The increase of supply here probably isn't going to be enough to drive rents down. It didn't happen when 626 Flatbush opened up a few blocks away. Housing is not one market. One of my favorite quotes on the topic is "when more steak places open in midtown, the prices don't go down at the McDonalds"